Breakthrough technology that looks up your clients' drugs for them. You know you should be offering Medicare Part D as part of your business. But the tedious tasks involved in running an MA-PD quote make it seem not worth your time. Good news! The Rx Import process in Lead Advantage helps simplify every quote by letting you help your clients to pull a list of their prescription drugs securely, in just a few easy steps. It's easier and less stressful for you and your client. 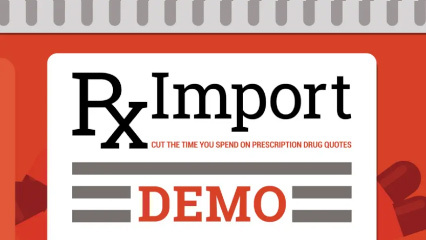 No need for your client to spend time and effort visiting different pharmacies to track down their prescriptions. Rx Import can do it for them. When running an MA-PD quote, Rx Import lets your client request a listing of their drugs, dosage and frequency, which can then be stored within our proprietary and secure system. This process will save valuable time for you and your client, and you can be confident that the drug list is accurate and up-to-date. Lead Advantage is our exclusive all-in-one sales management tool. You can receive and manage leads, run quotes, submit online enrollments and access multiple carrier portals all in one place.